While there are now so many window furnishings to choose from, curtains are still an attractive and wonderfully versatile window fashion option for any room in your home or office. From luxuriously heavy jacquards with full valances and tasselled tie-backs to clean low maintenance modern fabrics, there’s a curtain style for just about everyone. Here at The Blinds Place, we offer an amazing selection of beautiful custom-made and ready-made curtains which we would love to show you. Our ideally situated showrooms at Moorabbin (Melbourne) and Maroochydore (Sunshine Coast) are teeming with fabric and track samples for you to explore and select from. 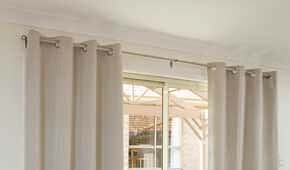 At The Blinds Place, we pride ourselves on offering more than the best selection of curtains in Melbourne, Brisbane and the Sunshine Coast — we also provide excellent customer service, including free consultations at your home or workplace. Best of all, there’s absolutely no pressure to order on the spot. To find out more about our growing range of custom and ready-made curtains, you may visit or call us at either of our two showrooms at Moorabbin or Maroochydore, or leave your details in our contact form and we’ll get back to you as soon as we can.